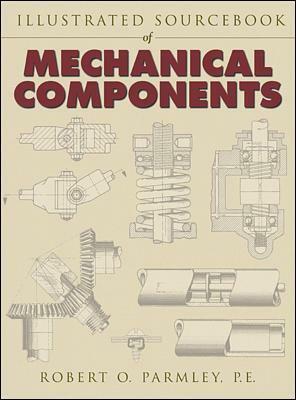 Patterned after volumes in McGraw-Hill's "Time-Saver Standards" series in the architecture program (and Wiley's "Architectural Graphic Standards") and vastly expanding the range of the best-selling "Mechanisms and Mechanical Devices Sourcebook" by Chironis, this major new handbook presents a full array of key machine elements used in a wide range of applications. Filled with thousands of illustrations, it provides a quick-look-up resource of pictorial detail (worth many pages of text) for the busy engineer looking for the right device for the right application all systematically organized for easy access. Robert O. Parmley (Ladysmith, WI) is President and Principal Consulting Engineer of Morgan & Parmley, Ltd., Professional Consulting Engineers. He is a member of the Nat'l Soc. of Professional Engineers, ASME, the Construction Specifications Institute, the American Design Drafting Assoc., ASHRAE, and SME. He holds a BSME and MSCE from Columbia Pacific University and is a registered professional engineer in Wisconsin, California and Canada. He is also a certified manufacturing engineer and certified wastewater treatment plant operator. He is the Editor-in-Chief of the Standard Handbook of Fastening and Joining 3/e, Field Engineer's Manual 2/e, HVAC Field Manual, the Hydraulics Field Manual, the HVAC Design Data Sourcebook, and the Mechanical Components Handbook, all published by McGraw-Hill.